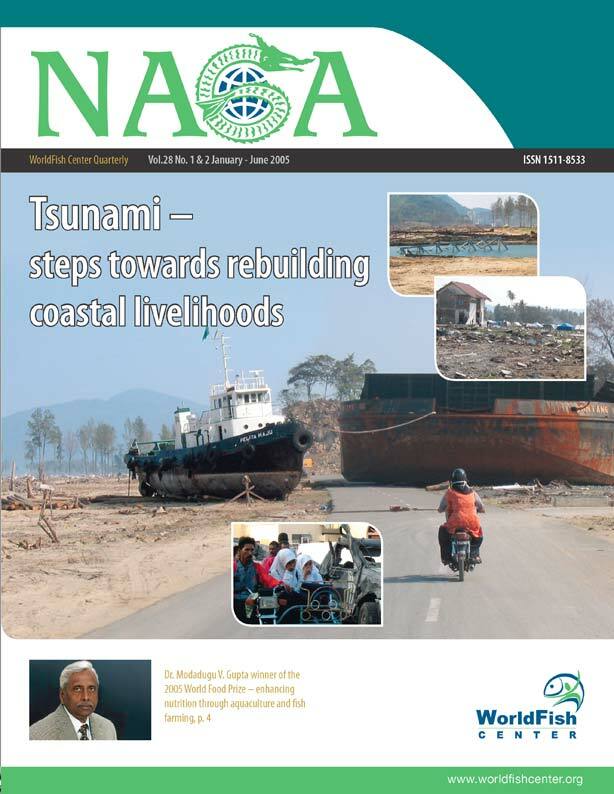 The Naga is a quarterly magazine published by WorldFish Center as part of its efforts to promote research and disseminate research results as widely as possible, as well as to create a strong network of institutions and scientists who can work together and exchange ideas. Naga publishes papers on interpretative, applied and descriptive scientific and technical aspects of interest to researchers, scientists and policymakers in the field of fisheries and living aquatic resources. It also includes news on research projects, notices of new publications, meetings, workshops, courses, symposia and news of personnel. The Naga is an underwater creature from Asian mythology. Superior to humans, it inhabits sub-aquatic paradises, living at the bottoms of rivers, lakes and seas in resplendent palaces studded with gems and pearls. It is the keeper of the life-energy that is stored in the waters of springs, wells and ponds. It is also the guardian of the riches of the seas  corals, shells and pearls. Naga represents the very focus of WorldFish Center, namely, protecting the wealth and productivity of tropical waters. The 2005 Naga Award Competition is on!